As you’ll come to learn in my video on Saturday, one of my goals for 2017 is to get better at budgeting. With the construction happening on my new house and future furniture purchases looming over my head, I want to make sure I am keeping track of what I’m spending and attempt to save a larger portion of my earnings every month going forward. I want to make sure I don’t get caught in a sticky situation, but also want to make sure I can finish decorating my house sooner rather than later. I know it usually takes awhile since there’s so much that needs to be purchased, but I’ve already waited so long to get this process started, so I’m more eager than I probably would’ve been had we gotten started right away! With that said, I’m shifting my focus of spending money on clothes and travel to furniture and home decor, at least for this year. While I won’t be giving up clothes cold turkey, I am trying to spend less, which means buying less expensive items. I used some of the money I got for Christmas on some sale items I scored earlier this week, but I’m hoping that’s all I will be spending on investment pieces for awhile. 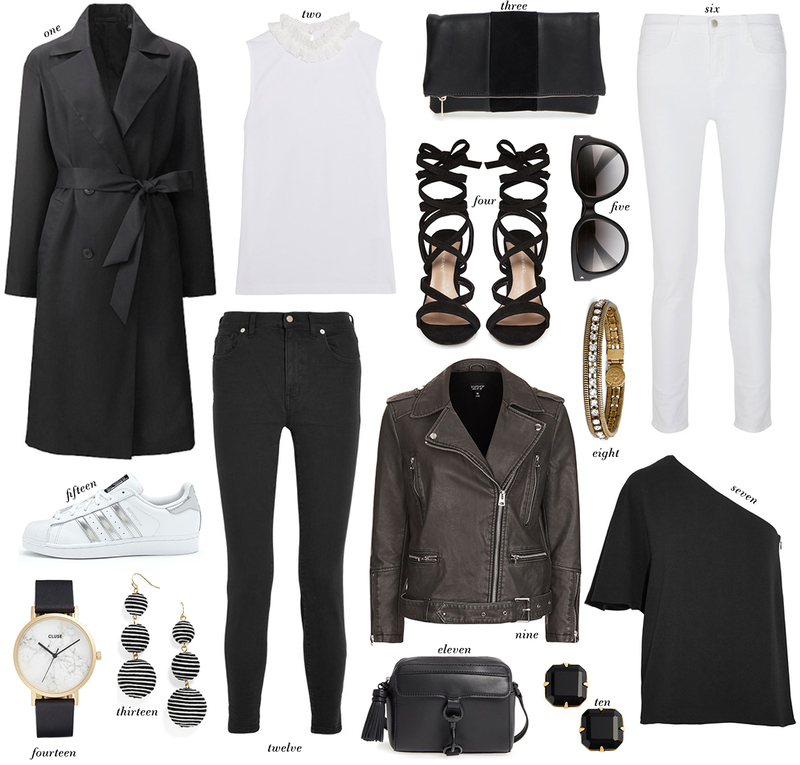 Here are a few black and white basics I’m loving right now that are all under $200, with many under $100 too! These SPANX leggings are flattering, comfortable and super versatile. Tuck them into OTK boots with a tunic blouse and fur vest for a night out, or with sneakers and an oversized sweater for errands and casual plans. The quintessential striped tee for everyday wear. A simple white off-the-shoulder blouse for pairing with jeans and sandals this spring. If you’re over that trend, try this cool white blouse instead! Love the texture + volume the pleats add to the look. This Keepsake LBD looks incredibly expensive, but it’s now on sale for only $90!! Crazy. Faux leather leggings for under $100? I’ll take two pairs. I am loving this. My New Year’s resolution (I feel like I have the same one every year) is to not buy any clothes until Spring. I am looking forward to your home decor posts. You have such great style and I can’t wait to see how your beautiful home turns out. Also, on snapchat, you said you wanted to copy the sheets/pillows/mattress, etc. from the purple room at your mom’s house. I am going to make the move to a california king this year and want a comfy mattress and want to invest in nice sheets! That coat is such a classic piece. It will be in trend in 20 and in 50 years as well.